That's some serious military hardware parading down city streets, but no, this isn't Moscow's Red Square—it's Long Beach, California. 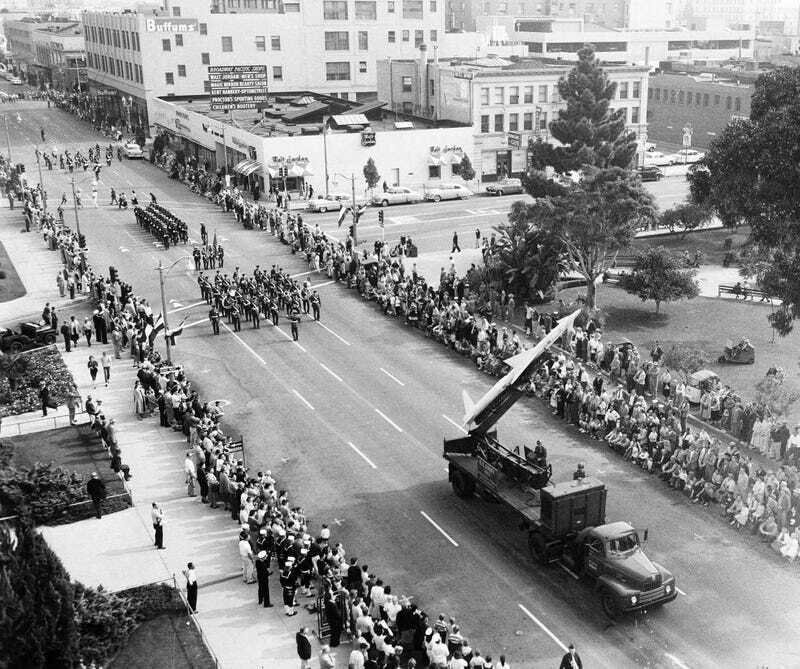 Coming only a month after the Soviet Union's successful Sputnik demonstration, Long Beach's Nov. 11, 1957, Veterans Day parade touted U.S. missile technology. One truck showcased a Nike anti-aircraft missile. Another displayed a Regulus cruise missile from the Long Beach Naval Shipyard. A banner proclaimed the weapon—typically armed with a nuclear warhead—as a "Defender of Peace." Meanwhile, Dorene Porter of the Long Beach Junior Chamber of Commerce shared a convertible with an elaborate tin-foil prop said to be a captured Soviet satellite. In all, the procession consisted of 129 separate units and lasted two and a half hours. Long Beach's may have been a particularly martial affair, but other Southland communities also emphasized aerospace technology in their Veterans Day events that year. Missiles rolled down the streets of Downey, Bell, and Burbank—a curious image for a holiday that originally celebrated the declaration of peace at the end of the world's first "Great War." All photographs courtesy of the USC Libraries – Los Angeles Examiner Collection. Southland is made possible by a partnership among Gizmodo, the USC Libraries, and the member collections of L.A. as Subject. Written by Nathan Masters, the series explores the urban past of Los Angeles, including the lost landscapes and forgotten infrastructures that continue to influence the city we know today.